Wondering which beautiful flowers you have to look forward to for springtime arrival? There are many! We love spring and we anticipate the freshness that comes with the season. After a long, but beloved, winter filled with poinsettias and pines, spring delivers bright and cheery blooms that burst with pastel colors and pretty shapes. Witch Hazel is a shrub that adds a bit of bright yellow to a home garden. An early spring bloomer, this flower can also be found in red in case you’re still wanting the winter hue in your home come April. Also called Eranthis, Winter Aconite gives forth pale yellow blooms that might not be the boldest in the bunch, but their early spring show is well received when they’re one of the first to push through snow. Snowdrop is another early spring bloomer that sometimes surprises people with arrival while it’s still snowing. 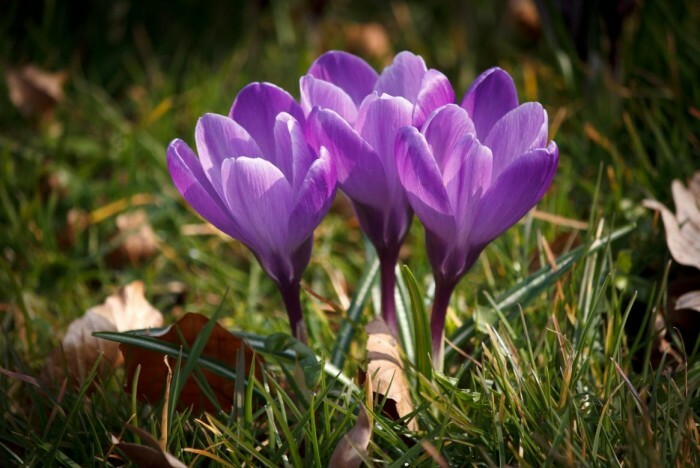 Crocus chrysanthus, Crocus tommasinianus, and Crocus sieberi are the leaders of the Crocus varietal when it comes to bursting through snow to give us a well-anticipated display. They typically bloom in shades of purple or yellow. Camellia is a popular shrub with blossoms that love mild winter climates, so you may just see them before spring comes. If wintertime is harsh, they’ll wait until spring has begun to show themselves to you. These flowers, also known as Christmas Rose or Lenten Rose, also do well in mild winters. They thrive in springtime, so consider planting them for a stunning spring garden display. In addition to these flowers, you’ll probably find chionodoxa and pansy blooming early during spring. Of course, depending on where you are, you may get only a few of these blossoms or a different group of spring blooms entirely. But, this list should give you great fodder if you’re shopping for flowers for a spring bouquet or garden plot.